AND hundreds of practice points - really great for teachers! Get your copy now at amazon.com. Just click the link below! This new addition features extended discussions on Dramatic Theory, Film Acting, Archetypes, other Vital Elements, and more! Almost thirty new pages! 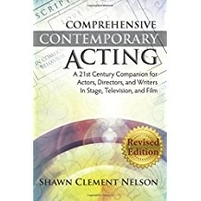 This is not your usual book on acting. Inside these covers are the secrets to star-quality acting. Keep it next to you at all times. Bend it, fold it, dog-ear it, throw it on your car seat next to you. It costs less than a half-hour coaching session. It will change your mind about acting. Well, yeah, naturally it's not for everybody. Today, because so many projects are created and written by writer/producers - the actor's employers - it is essential that the actor and director truly understand the writing they have been given to direct and perform. While I - like many of you - grew up in theater, my work is in film and television. 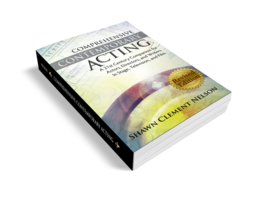 Comprehensive Contemporary Acting is certainly a serious book on acting technique and philosophy - but it is especially valuable for actors, directors and writers in film and television. This is because the focus of CCA is the product that audiences watch at home on TV, and in the movie theater. Unlike doing a performance of a play by Arthur Miller, Tennessee Williams, or Edward Albee - where the writer / creators of the material are no longer on the artistic scene (and the project is naturally given to being director - actor driven) today's world of film and television is executive-writer driven - quite a different paradigm! Consequently, our work can no longer be actor-centric. ...where the actor is one of many team members, and the employers are not only not distant, but in fact daily on the scene! The product we all watch on the television and the movie screen is the end result of the work of a large team of artistic professionals. It begins with writers and their writing. These writers are now, more often than not, the creators and executive producers of the shows they are running. The directors of television pilots are creative entities who are rewarded financially in perpetuity for their co-creation of the television pilot. The actors are stars and working actors - talented, dedicated, and at very different places in their careers. After having taught and coached working actors and stars for over three decades - here in Hollywood and elsewhere - I have had the good fortune to meet and work with some incredibly remarkable and talented people. These industry professionals have brought me a wealth of knowledge, which - when joined with what I have learned from brilliant and gifted teachers, and then developed myself over the years - makes for an unusually deep well of dramatic understanding. Here are only some of what you will not see in other books on Acting! *Behavioral secrets for handling highly emotional scenes - especially for camera! *A new model for Spontaneity (and no more craziness). *The 7 types of Love Scenes: how to see them, how to define them - and how to act them! So often, clients enter the coaching room thinking the material is one thing, only to later realize that they have been given something to perform that is far more wonderful than they can have imagined it was. Writing - and how to act it - is not always obvious. In fact, the better the writing, the less obvious it is. Good writing has clear writing, but it is usually delivered onto the page with a dramatic bias toward one tone or another. This tone becomes obvious once we have established exactly what kind of scene it is, what the dynamics are, and why the scene is in the script. Then we can see more clearly the most appropriate way to ACT the material. This is precisely what is dealt with in Chapter 24 - Script Evaluation - Understanding Love Scenes. Once we understand the material, then we must proceed to a clear vision of what is indeed act-able in the writing. Much of what we have learned as actors is not even intended to be considered in a scene. Including useless and unnecessary ingredients - and especially including arbitrary negativity in the work - can only serve to confuse an audience and leave them without the correct emotional context to engage in the story. We deal with this in Chapter 6 - Removing Arbitrary Negativity - What to leave out, and what to keep in! Then the all-important understanding of exactly what should be acted in the scene, and what is specifically called for - in a scene, in a line, and even in a single word. We deal with this in detail in Chapter 17-What to Act. Included in this chapter is a glossary of over 300 descriptive, externally-oriented actions to better help you think about where to place the work in proper tone and context. I have designed this book to be a tough, long-lasting companion for the performing artist, and for the creative minds that shine in our industry. It belongs on the front seat of your car, in your backpack or briefcase, or on your kitchen counter - and always at the ready for instant reference about a very wide range of creation and performance situations. The price is slightly more than a 15 minute one-on-one, private coaching session. I know you will find it of far greater value than the price!